“I have never had a single concern about my child’s eating!” …said no parent, ever. There are worries at all stages of life, from infancy (“Is she getting enough milk?”) to the teenage years (“Too much junk food!”)—with many years in-between spent bemoaning picky eating habits. When one parent—or both—embrace a vegan diet, it adds a layer of complexity. Well-meaning relatives worry about the child’s protein, calcium or iron intake. 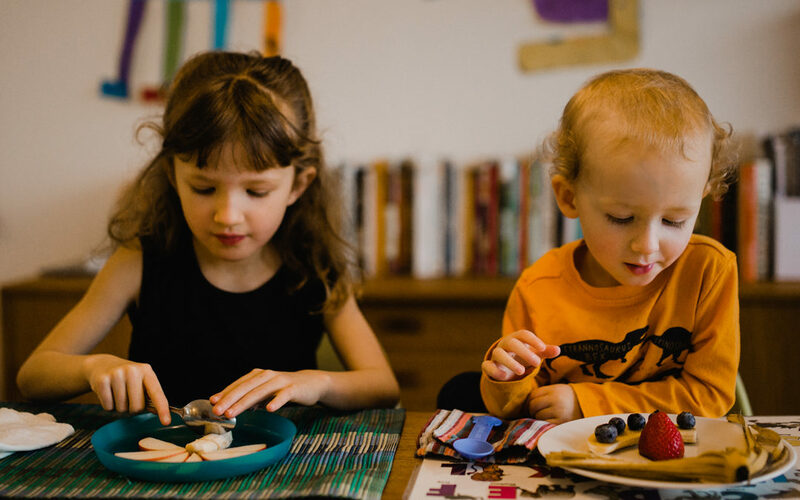 If both parents aren’t on the same page, it’s also easy to point a finger at the plant-based food: would the child eat more if mom didn’t insist on serving beans and vegetables instead of chicken nuggets and cow’s cheese? Yet, at the time of day when we are most tired from the demands of the daily grind, we have to come up with an answer to this critical question: what will the children eat? When things go sideways, we are often too “hangry” to calmly assess the situation and choose a smart course of action. We just want the whining and battling to stop. There are two common outcomes. We either give in and offer a different “meal” (like a bowl of cereal), or we put our foot down—dinner’s dinner and that’s that, take it or starve. Neither feels right, but we can’t seem to come up with a better reaction on the spur of the moment. Can we please take a step back? This is important enough to warrant a little bit of forethought and planning. We are the food we eat, and our children are no different—except that the stakes are higher. Their bodies are growing and they are forming food habits that will last a lifetime. What can we do to help our kids develop a healthy and joyful approach to food—without losing our minds? 1. Think about your goal. It helps to have the big picture in mind. What are you trying to accomplish over the next year or two, food wise? The goal has to be realistic considering where your child currently is on their food journey. Mine is for my kids (currently 5 and 2) to grow eating and appreciating a slightly broader variety of cooked foods. Currently, they will eat a few different types of vegetables, beans and grains, but only if they don’t touch or aren’t “spoiled” by sauce. They will, however, eat chickpea-noodle soup with a clear broth. It would be easier for me, and cleaning up would be so much faster, if they started eating the same complete dishes as adults, like pot pies, lasagna, pasta with (heaven forbid!) the sauce on it, vegan omelets, etc. I would be satisfied to expand their menu from soup to three or four other meals in the next year. Take a moment to reflect on the last few months of eating and try to see the world through your child’s eyes for a moment. For each of your picky eaters, create three lists. First, make a list of their favorite meals, those that get them excited to come to dinner, regardless of what you think about the appropriateness or healthiness of those meals. Then, jot down all the foods (individual ingredients and complete meals) they will actually eat—again without prejudice. Finally write down the foods they find repulsive. It helps to do this exercise with your child’s input, as it may help them feel more engaged and empowered about meals. 3. Include one or two “safe” ingredients per meal. For every meal in your plan, include at least one safe ingredient, two if possible, that are “safe” for your picky eaters, meaning foods they will eat without reservation. Go for the healthiest ones, or try to modify them so they at least approach your standards. Make sure there is enough of it so that they feel like they will not starve. As much as possible, those should be ingredients that also belong in the main dish the rest of the family will eat, so you can highlight how children and adults eat the same thing. For example, if I am making a Buddha bowl, I set aside some raw, uncooked tofu and some unseasoned quinoa. Or, if making a chili, I have to remember to keep some unseasoned beans aside. I suggest planning no more than one or two meals per week with foods from the no-no list. This may be challenging if the list is long. 4. Let friends introduce friends. If your child, like mine, is averse to mixed foods, your best chance is to start by combining just two favorite foods together. My daughter doesn’t mind plain quinoa and loves dried cranberries, so a bowl of quinoa with a few pink dots stands a chance. Meanwhile, the adults will eat a complete quinoa meal salad. Lightly sweetening foods on their first few appearances also increases their chances of being welcome in the future… even after you stop adding that extra touch of maple syrup. A pinch of sugar in the broccoli cooking water may work magic! 5. Include one favorite meal per week. Schedule at least one “happy meal” per week taken from the favorites’ list. Make it a meal that says “Mom/Dad loves me and prepares food I enjoy.” For my daughter, it’s some version of veganized chicken noodle soup. My kids will also enjoy vegan pizza. It’s a very short list, so it can get a bit boring for the adults, but I think it is important for the grown-ups to eat a recognizable version of the kids’ food while also visibly enjoying a side dish that stretches the definition of “acceptable” from a picky eaters’ point of view. Planning is one thing. What happens when you get to the dinner table? Whatever you do, avoid forcing. Every study done on picky eating has repeated it: forcing a child to eat a food they find repulsive—even “just a little bite”—will backfire and lead them to hate it even more. Such food aversions can last long into adulthood and ruin perfectly great vegetables needlessly. Nobody builds happy food memories and positive associations when forced me to put something in their mouth and swallow it or to eat out of spite when assailed by hunger pangs. Nevertheless, your picky eaters may be gently talked into engaging in playing with and sensory exploration of foreign foods. First, let them have a close look. Then maybe encourage them to smell it—a great way to check if it’s safe! All clear? What about a lick? No need to make a big deal of it, but if your child is curious, they may play along. Maybe they won’t go as far as taking a bite today, but next time the food shows up at the table, it won’t be a stranger anymore. 7. Practice respect—for yourself and for the cook. We teach our children that our bodies belong to them and that they can say “no” if they don’t want someone to hug or kiss them. Then why would we make them eat something? They are the masters of their bodies and should be respected as such. But, as the cook who toiled in the kitchen to prepare the meal, we deserve respect too. We certainly shouldn’t take their reluctance to eat the food we make personal, however, we can teach them how to express it politely. Keep the long game in sight. Food and nutrition are a long game. We take a long time to build our food habits, and they cannot be changed overnight. Obviously, this is more complicated, requiring more patience and empathy, especially if there are adults with different points of view involved in rearing the child. I think the hardest thing about cooking dinner deciding what to make. My site Vegan Family Kitchen offers free meal plans, "cook once eat three times" recipes, and meal prep strategies to help you say goodbye to processed food. My passion is helping moms and dads cook more vegan meals.